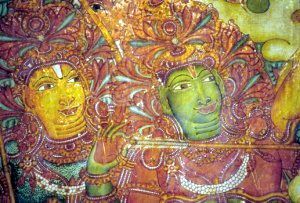 When one speaks of the ancient tradition of South Indian mural painting, one recalls the majestic murals adorning temple walls. But what about its more contemporary adaptation? The works of famed Modernist A. Ramachandran immediately come to mind. Born in 1935 in Kerala, he wrote his doctoral thesis on Kerala Mural Painting between 1961 and 1964. His paintings—besides showcasing a strong command over line, colour and form and creating an exciting visual drama—invoke the traditional mural paintings of Kerala in their scale. Ramachandran’s famous 1986 work titled Yayati revisited a tale from the Mahabharata and exploited the monumentality of the canvas to narrate this epic tale. Moving into the present, artist Manikandan Punnakkal takes this rich heritage forward with his reinterpretation of mural painting. His innovation lies in rendering two dimensional paintings in plaster, which creates a vibrant effect of light and shade. My own encounter with Kerala’s heritage was not too long ago. When I visited Kerala for the first time in July 2011 with a couple of friends, I was struck by many things – primarily, the architecture with dramatic roof shapes that bore no comparison with other Indian regions, and secondly, the variety of food my friends and I could eat after three weeks of a Tamil vegetarian regime based on thali meals. In Cochin, we visited the Mattancheri palace built for the Raja of Cochin around 1555. Over there, I stumbled upon its mural paintings—48 earth tone paintings covering the king’s chamber greeted me warmly. The frieze illustrated the epic of the Ramayana. Though a common theme in Hindu temples, here it was painted, rather than carved. The extraordinary detail in these paintings bore a stark difference to those of the Rajasthani and Gujarati schools. Detail of the Ramayana frieze, Mattancheri palace in Cochin, mid-16th century. Rama and Lakshmana on the battlefield. This 16th century work is part of a greater tradition of mural paintings in Kerala. The earliest painting, found in Tiruandikkara (now in Tamil Nadu) is dated to the late 8th-9th century and already shows its attachment to Hindu themes. Royal patronage encouraged this art form in ancient temples, churches and palaces of the region, and these frescoes illustrated the ethereal world of divinities. The specificity of the wall preparation and the use of natural pigments are now being revived by a new genre of artists actively involved in researching and teaching mural art whose reference period corresponds with the Mattancheri palace development from the 16th – 19th centuries. Indeed, the expressiveness of the face reached in modern paintings should classify them among the finest works in South Asia. They strictly followed sacred texts such as the Puranas and technical ones like the Silparatna written in the 16th century, whose iconographic prescriptions are still in use by practitioners nowadays. According to the tradition, painters should refer to the panchavarna principle by exclusively using five colours -white, yellow, red, green and black which are specific for each divinity. Traditional paintings are sacred in two ways: in their representation of deities and their placement in the inner chambers of the temple. The sacredness of the deity is transposed onto these paintings, lending the two dimensional deities as much spiritual power as the main murti, or idol. But Indian Contemporary muralists do not stick to the limited palette imposed by tradition. Manikandan Punnakkal, now popular for his mural paintings, adds blue backgrounds to some of his compositions, giving them a touch of sophistication. His central gilded forms are as tantalising as jewellery. Apart from his cool-toned nuances, Punnakkal chooses to get rid of restrictions imposed by the fresco format. He opts for a large canvas size—a support which is more appropriate than frescoes to make a series of voluptuous musicians. He chooses to focus on a central figure, unlike the numerous figures that crowd traditional frescoes. What’s undeniable and evident in its closeness to tradition, is his preference for popular icons such as Ganesha and gopis playing various instruments. Both A. Ramachandran and Manikandan Punnakkal have adapted traditional Kerala mural paintings to their style, and they sure know how to appeal to their audiences! Besides these works which are a part of StoryLTD’s “Kerala Lyricism”collection, Punnakkal has accomplished much more: he undertook the giant task of painting 80 murals at the Vaikom Mahadeva temple in Kerala—proof to the artist’s talent and perseverance. Punnakkal’s isolated figures in these paintings actually speak to me more than my encounter with those mural paintings from Cochin did. Indeed, it is the lone figure that draws our attention, the one we attach ourselves to and identify with.